First, find a spray container (aka squirt bottle). Add 2 teaspoons of organic liquid soap and fill the rest of the container with room-temperature water (never use hot water). This will help dilute your natural soap solution. With your bottle, spray your fruits generously. Finally, make sure to rinse your fruits thoroughly before serving or consuming them. First, find a large container or bowl and place all of your fruits inside. Add room-temperature water until all of your fruits are fully covered. Avoid using hot water as it may ruin your fruits. Add 2 teaspoons of organic liquid soap and mix the diluted solution with your fruits. Let it sit for 30 seconds. 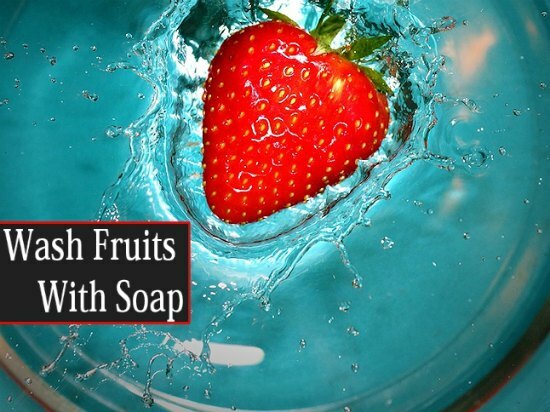 This will help wash your fruits with soap. Finally, remove fruits from your container and rinse thoroughly before serving or consuming them. Wash fruits with soap to help remove pathogens and bacteria from your food. It is safe to use diluted soap water to wash your fruits and rinse them before serving or eating. 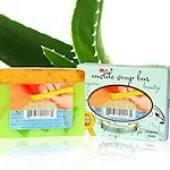 Remember to use an organic soap product such as castile soaps or any other organic soaps.